On this date in 1752, 32-year-old Mary Blandy was hanged for the murder of her father, Francis. He had died in agony on August 14 the previous year, having been sick for months. That Mary had poisoned her father with arsenic was not in dispute; the evidence proved it and she admitted it herself, even before he died. The question was as to her motive, and her intentions. Mary conceded she had caused Francis’s death, but denied having ever meant to harm him. The events that lead to Francis Blandy’s demise at the age of 61 began in 1746. Mary was Francis’s beloved only child and an old maid by the standards of day. They lived in Henley-Upon-Thames, Oxfordshire, UK. 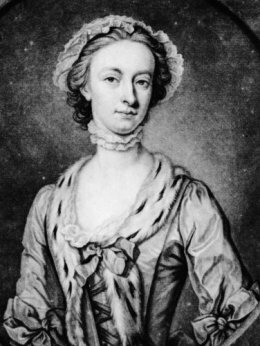 Although scarred from a bout with smallpox, she was well-educated, witty and intelligent, and advertised a dowry of £10,000. But she had never been able to find a suitor her father approved of, until Captain William Henry Cranstoun came along. Cranstoun was several years older than Mary, short, ugly, a compulsive gambler and not terribly bright, but he was a member of the Scottish aristocracy, the younger son of an earl. When he proposed in 1747, both father and daughter happily said yes. Unfortunately for the two lovers, Francis Blandy soon learned that Cranstoun was already encumbered with a wife and child back in Scotland. Cranstoun swore (falsely) that he was not legally married to the woman and she’d only ever been his mistress; smitten Mary believed him, but Francis didn’t take kindly to the deception and he showed his would-be son-in-law the door. Cranstoun, however, was not going to let a £10,000 dowry slip through his fingers so easily. While he tried (unsuccessfully) to annul his existing marriage, he remained in touch with Mary for years and told her about a special powder made by wise women in Scotland, which caused those who took it to forgive their enemies. Mary was skeptical, but Cranstoun swore it really worked and said he’d taken it once himself and felt its effects. He obtained some of the powder and convinced Mary to start slipping it into her father’s food and tea, so his heart would soften and he would allow his daughter to marry the man she loved. Such was Mary’s story, at any rate, and she stuck with it until her dying day. She swore she did not realize the magic powder was toxic. Sure, Francis rapidly became sick with heartburn and stomach pains, but he had suffered these symptoms before. Then his condition worsened. He vomited constantly and all of his teeth fell out. Mary finally summoned a doctor. By then it was too late, for both father and daughter. The family servants became suspicious after several of them got violently sick when they drank tea intended for Francis. One of them noticed a white grainy substance in the bottom of a bowl of gruel Mary had fed her ailing father. The servants took the substance to Francis’s doctor, who determined it was arsenic. Around the same time, another servant saw Mary throw a bundle of Cranstoun’s letters into the fire. She also tried to burn a packet which the servant rescued from the flames; it contained white powder identical to the arsenic that was rapidly burning through the old man’s entrails from the inside out. As he lay in extremis, Mary rushed to his bedside and begged her father to forgive her. An indulgent parent to the very end (or perhaps the “forgiveness powder” really had worked), he blessed his wayward child and told her he would “pray to God to bless thee, and to amend thy life.” He blamed Cranstoun for everything. Mary ran from the house after his death, pursued by an angry mob, and took refuge in the Little Angel Pub. Eventually she was persuaded to surrender herself to the authorities. On August 17, she was arrested. When Francis’s estate was settled, its worth was determined to be only about £4,000. Cranstoun would have never gotten that £10,000 dowry: it didn’t exist. ‘A vast concourse of people’ gathered for the trial, including many students from the university (whom one prosecutor could not resist lecturing ‘See here the dreadful consequences of disobedience to a parent’). The proceedings lasted but a single day, albeit a long one, running from eight in the morning till nine at night. Conducting herself ‘with more than masculine firmness’, Mary continued to insist that she was the victim of a cruel deception (‘What women can withstand the arguments and persuasions men will make of us?’), but the jury would have none of it. Devoting only five minutes to deliberation, not even retiring from the courtroom, they pronounced the defendant guilty. The prisoner was hanged five weeks later, on 6 April 1752, still avowing her innocence: ‘May I not meet with eternal salvation,’ she declared from the scaffold, ‘nor be acquitted by the almighty God, in whose awful presence I am instantly to appear,’ if guilty. Then, ‘without shedding one tear,’ Mary Blandy pulled her handkerchief over her face and dropped into eternity. There was a lot of public sympathy for Mary, particularly after her execution, but none for Captain Cranstoun. The Newgate Calendar called him a “profligate wretch” and “a disgrace to the noble blood from which he derived existence.” He escaped the grip of British justice by the skin of his teeth, going into hiding in the Continent when he found out about his fiancee’s arrest. In the end, however, he got what was coming to him: nine months after Mary’s death, in Belgium, he was stricken by an unspecified intestinal ailment and met much the same end as Francis Blandy. Be all this as it may, an obvious lesson is to be learnt from her fate. — Young ladies should be cautious of listening to the insidious address of artful love as they know not how soon, and how unsuspectedly, their hearts may be engaged to their own destruction, founded on the violation of all their nobler duties. Mary Blandy was buried between her parents in the Henley Parish Church. There is no trace of her grave today, but her ghost is said to haunt the Little Angel Pub and also the site of her execution, which is the present-day Westford shopping center. She would be remembered for hundreds of years after her death. Scottish lawyer and true crime writer William Roughead published an examination of her case, The Trial of Mary Blandy, in 1914; it is available free online here. Roughead concluded Mary had deliberately murdered her father. The case was made into a BBC miniseries, and in 1950, Joan Morgan published a novel based on the story, called The Hanging Wood, later retitled simply Mary Blandy. Update: Because you can find anything on the Internet: the story of Mary Blandy in shadow puppetry.